We're making good progress with the home renovations and I'm almost ready to share the first room reveal with you - I'm just waiting on a few final pieces to arrive before I shoot the bedroom makeover. In the meantime here's a little glimpse of how it's shaping up so far. The curtains are just a temporary solution. I've bought some lovely grey washed linen and plan to make some up to size. After a lot of deliberation I've decided to have a go at making my own. I should probably mention at this point that I haven't been anywhere near a sewing machine since I was at school so wish me luck with that one! Anyone know of any good blogs or youtube channels for curtain making tips? Today I wanted to show you the beautiful throw I was recently sent by ZigZagZurich from their Artist Blankets Collection* - a unique collection of home textiles that promotes the work of artists, designers and illustrators. I want this room to feel really calm and minimal so I've been pretty ruthless about editing what I've allowed into this space, but I absolutely adore this throw. It's basically like a piece of art for the bed. Jacquard woven from super fine cotton it's also reversible - I actually can't decide which side I prefer. Here's the other side getting Albert's seal of approval. There are over forty different blankets in the collection, and it's particularly strong on geometric and typographic designs. There are plenty of colourful options to choose from but it's the monochrome designs that really stand out for me. 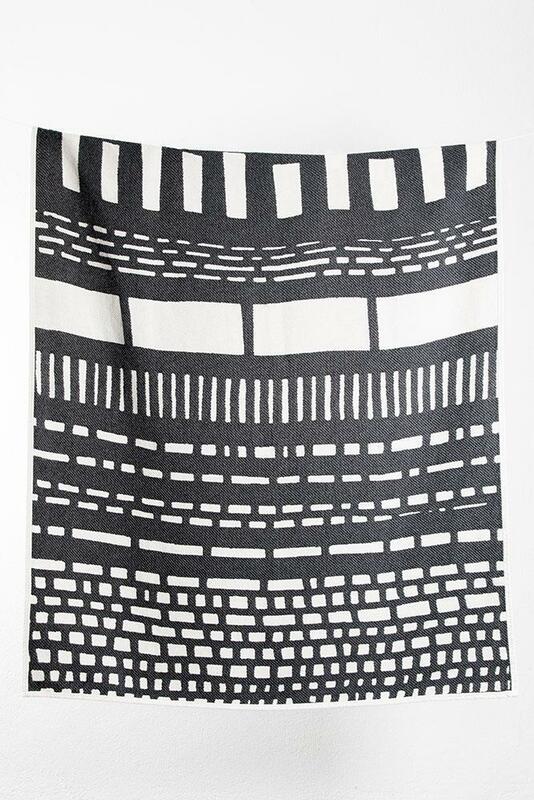 This one is by Kapitza, a multidisciplinary design studio run by sisters Nicole and Petra Kapitza, but other highlights include some stunning black and white throws by Memphis designers Nathalie Du Pasquier & Georg Sowden. Here are just a few of them. * Cotton throw kindly gifted by ZigZagZurich.